Maar Map imposed on 1859 Horchester map of Auckland's volcanic field. 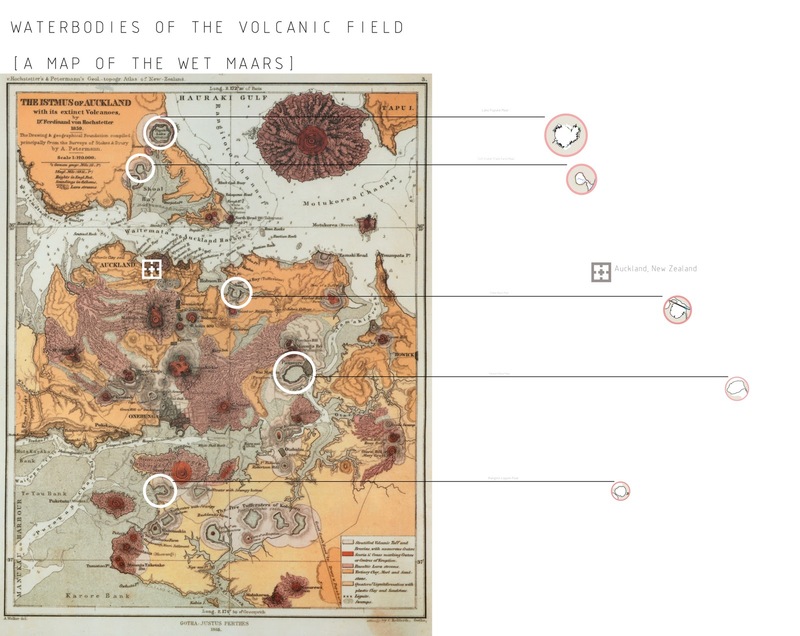 My aim for the maar map was to place an emphasise on the points in Auckland's volcanic field which converge with Auckland's waterbodies. Water and volcanoes are two of the most defining characteristics of our city, yet there is a seperation in their relationships. When we view a map of Auckland, say on Google maps, we cognitively place the volcanic cones we recognise from our own spatial experience of Auckland where they are indicated on the map. The way in which we are accustomed to reading a map allows us to cognitively place spatial experience with a diagrammatic delineation of the place in which we are imagining. "There is no spatial representation free of spatial conception." The image above compares the 1859 map of Auckland with my own reductive version of the Maar Map. The relationship between these waterbodies are the same as the older map. However any other indication of spatial experience around them has been removed, including the actual coastline, roads and property boundaries etc. The maps we commonly use today are becoming furthermore reduced of their illustrations of spatial experience, that is why I have chosen Google as a point of reference with the symbol used to indicate the centre of the given place in which you enter your search. The symbol has the power to reduce more literal spatial conceptions of the map. The blankness of the surrounding map not only emphasises this power but seperates the maars from other features in order to exclusively highlight their network. We are accustomed to reading this symbol as the centre, to which we attach the surrounding spatial qualities that we may have experienced. My aim is for this symbol to reference the reductive nature of the contemporary maps we use and have access to basically anywhere with an internet connection. These reduced maps, to verying degrees, rely on our own spatial conceptions of a place in order to function. Therefore, as a contemporary verson the 1859 map, the commentary made with the comparison highlights the disconnection of the Maar as volcanic features from their surrounding network of volcanic cones. We can see the maars outlined on the 2D Google map which we associate to the actual waterbody, and we can see the volcanic cones we associate with their indication on the map as we imagine Auckland in perspective. Being able to see the cones looking across the city allows us to understand their relationships within a network. A network in which the maars are not a part of due to the significant difference in physical form. The maar map does this in reverse, by exclusively showing the quantitative relationships between the maars which can only function as existing in a network in their 2D representation (unlike the volcanic cones which we can compare to one another by experiencing several at a time in perspective). Coupled with the Google symbol of the centre placeholder, we know to situate these waterbodies within the wider network of volcanic cones and of course Auckland itself.